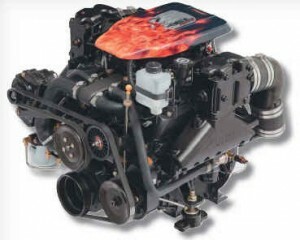 Performance Product Technologies handles a variety of different Mercruiser 4.3L V6 Bobtail Engines and Longblocks. The GM 4.3L engine has been used in Marine Applications since 1986. The 4.3L changed to the Vortec style (8 Bolt Intake Manifold) in 1996 and for Marine Applications it’s known as the Gen + version of the engine (Read More). Its important to note that the VORTEC terminology is not the same for Marine as with Automotive. NOTE: The “Vortec” version of the the 4.3L V6 engine was being used in automotive applications well before it was introduced into Mercruiser and Volvo Penta marine applications. 1 Power Rated in Accordance with NMMA (National Marine Manufacturers’ Association) rating procedures. 2 Power Rated in Accordance with SAV 1 rating procedures. Horsepower differences shown result from differences in test rpm, allowable test tolerances, and/or installation of special kit components. 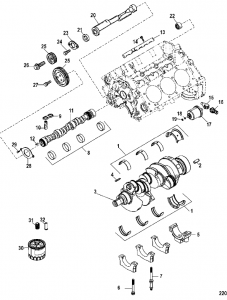 3 Measured using an accurate service tachometer with engine at normal operating temperature. 4 A special procedure must be followed to check or adjust timing. Consult your Authorized mercury MerCruiser Dealer before attempting this procedure. 5 A special procedure must be followed to adjust idle rpm. Consult your Authorized Mercury MerCruiser Dealer before attempting this procedure. 6 Idle speed on EFI models is not adjustable.